CEC are proud to present full hospitality packages for the 2015/16 Premiership season. Packages include executive boxes at Newcastle United and full hospitality at Manchester United, Chelsea, Tottenham Hotspur, Liverpool and all other major premiership football clubs. We have several restaurant facilities at St James’ Park which will offer you and your clients’ excellent football hospitality. 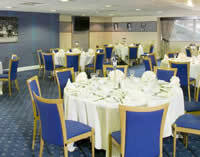 The Premier Suite is situated in the Milburn Stand of St James’s Park and offers excellent football hospitality which is good value for money. Your seats are located in the executive section of the Milburn Stand near to 18 yard line and offer excellent views of the pitch. The suite is further highlighted by a pre and post match analysis. Private tables are available for groups of 8, 10 and 12 guests. Smaller numbers will be accommodated on shared tables. The Platinum Suite is located on the Chairman’s level of the Milburn Stand and is the perfect way to experience first class hospitality at St James’s Park. Luxury Directors box seating near the halfway line offers you and your guests fantastic views of the match. We also have an executive box at Newcastle is in a prime location, near to the 18 yard line, with seats on a private balcony outside enabling the fantastic atmosphere of St James' Park to be enjoyed to the full. Please call our Sales Department on 01825 760065 to obtain availability and current match prices.